After my son Christopher Clowery’s ordination with Ch’an Buddhist Master Hsüan Hua, he and a fellow monk made an 800-mile “three steps, one bow” pilgrimage up California’s Pacific Coast Highway from Los Angeles to the City of 10,000 Buddhas monastery north of San Francisco, to promote world peace. They made a full prostration to the ground every three steps. This spiritual journey took two years and nine months to complete. For those years and three more, Heng Sure (as my son was now called) kept a vow of silence, speaking aloud only to his teacher, Master Hua. I had not received any letters from him for five years because his vow of silence also included correspondence by mail. 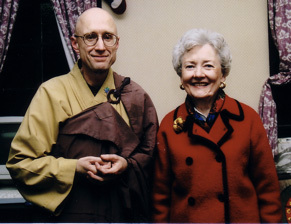 Therefore, it was with a great deal of anticipation that I flew from Ohio to California for a visit with my son when Master Hua, the abbot of the City of 10,000 Buddhas, invited me to celebrate my sixty-first birthday with Heng Sure. As a lifelong Methodist (Heng Sure had been an active Methodist in his younger years as well), I was eager to learn all I could about the religion that had captured my son’s interest so completely that he had chosen to dedicate his life to it. I had never doubted Heng Sure’s sincerity, but it was the era of cults and I was skeptical about whether the abbot’s motives were altruistic; many other movements were not sincere. As I drove through the impressive Chinese-style tile-roofed gates of the City of 10,000 Buddhas with Fang Guo Wu, the laywoman who had picked me up at the airport, I felt as one does when approaching a foreign country. I knew I wouldn’t understand everything that was said or done, and I didn’t know what was expected of me. Up the hill from the gate I could see a large bronze sculpture of a Buddha under a high roof, and beside it an enormous bronze bell. In the dining hall, the abbot sat on a raised platform in the center along one wall, with about twenty-five monks and as many male guests to his left and about fifty nuns and female guests to the right. The abbot was a stocky man in a gold-colored robe. His face was unlike that of anyone I had ever seen. His expression was one of a compassion that was guileless yet wise. After getting acquainted with him later, I had the eerie feeling he knew what I was thinking. At the first dinner, we ate our meal in silence. I discovered that this allowed me to concentrate on the food in a way that ordinary dinner conversation prohibits. I was learning that Buddhists not only savor each nuance of flavor, they also contemplate the work it took to bring the food to the table. They consider whether their conduct merits receiving it and how greed is a poison to the mind. They think of food as medicine to cure the illness of hunger. They take the food to help them cultivate the Way to benefit all human beings. I tried everything that was served, but I still had some food left on my plate at the end of the meal. I didn’t realize this was a faux pas until I followed my hostess in a line that led to two large dishwashing kettles. We were to dip our plate first in the soapy water, then the clear water. Someone had to clear mine before I could follow the washing routine. Obviously, Buddhists waste no food. One day when we had finished the meal, the abbot began speaking in Mandarin, and one of the nuns translated his words into English. He announced, “Heng Sure’s mama is with us to celebrate her birthday.” It was the signal for one of the nuns to bring out a cake for us to enjoy. I had not expected the abbot to observe our Western tradition. It reassured me that he was ready to adopt American customs. The exchange afterward with other mothers touched me on a deeper level. One of the American nuns, an Asian guest and I were asked to talk about our sons. The nun was a “Left Home” person, a man or woman who has taken the Buddhist vows and broken family ties to be part of the Buddhist order. In her earlier life, she had a son. The Malaysian mother and I both had sons who had left home to become monks. We were different ages and had come from different cultures, but we had the common bond of a mother’s love for her child and shared the same sense of loss. One day the monks arranged for a “liberating of life” ceremony, planned in honor of my visit. Buddhists in San Francisco purchased turtles destined for the city’s restaurants and brought them in crates to the monastery. They were carried into the Buddha Hall and laid in front of the altar, where they scrabbled and frantically clawed the wooden crates. When the gong sounded for the prayers and the chanting began, the turtles became very quiet, almost as if they were soothed by the sound. Prayers were made for their well-being because the Buddhists believed that by their not ending the turtles’ lives, the turtles could continue to strive toward a higher form rather than having to start over again in the endless cycle of birth and death. After the ceremony, my hostess, Fang Guo Wu, drove me to a nearby lake, where the turtles were to be released. Although I had never held a turtle larger than a silver dollar—and these were the size of dinner plates—I and the other people there were expected to pick one up and carry it to the water. I chose one that looked docile, but as I took hold of him “midships,” his little feet became four rotors that I had to keep from clawing my shirt and slacks. He was as anxious to gain the water as I was to put him down, so it was a quick trip. When I eased him into the lake, he disappeared beneath the muddy water immediately, and I thought the ceremony was finished. Guo Wu said, “Watch. They will thank us.” I thought she was joking, but out about fifty feet in the lake, little heads began to pop up. The turtles turned, looked at us and disappeared again. Guo Wu said, “Keep watching.” In a minute or two, farther out in the lake, turtle heads appeared again, turned and looked back. I couldn’t believe it. Guo Wu said, “They will thank us three times,” and they did. I can’t explain it; I just know it happened, and it was a very satisfying act of kindness that I enjoy remembering when I see turtle soup on a menu. The many kindnesses of the Buddhists made an impression that has stayed with me for many years now. They live their religion in a way that I admire. I know Heng Sure will never marry or give me grandchildren, which is disappointing, but as a Buddhist teacher he is influencing many more children than he ever would as a father. It makes him happier than anyone I know, and I can honestly say I am proud my son is a Buddhist. Deborah Kerr Metcalf, age eighty-six at the time this article was written, ran the book club, movie circle and garden project in her retirement community. She wrote a column for Adult Living magazine in Toledo, Ohio, in which she shared memories of growing up during the Depression and World War II.